This privacy statement discloses the privacy practices for Room 58 Ltd© and Lawless Harley-Davidson®. This privacy statement discloses the privacy practices for Lawless Harley-Davidson®. Lawless Harley-Davidson® promote the use of fair information practices. Because Lawless Harley-Davidson® is committed to your privacy, we have agreed to disclose our information practices. Lawless Harley-Davidson® is the sole owner of the information collected on this site. Lawless Harley-Davidson® will not sell, share, or rent this information to others in ways different from what is disclosed in this statement. Lawless Harley-Davidson® collects information from our users at several different points on the web site. In order to obtain a vehicle price quote, a user must first complete a Quote Request Form. A user is required to give their contact information (such as name, address, telephone number and e-mail address). This information is used to contact the user and provide the quote or other information that they have requested. It is optional for the user to provide financial information, but can be done so that Lawless Harley-Davidson® can review and pre-qualify the user for financing if they are interested. All customer information obtained via the quote request form is encrypted for security purposes and stored on a secured server. Information is requested from the user on the e-Catalog order form. Here a user must provide contact information (like name and shipping address) and financial information (like credit card number, expiration date). This information is used for billing purposes and to fill customer's orders. If Lawless Harley-Davidson® has trouble processing an order, this contact information is used to get in touch with the user. All customer information obtained via the order form is encrypted for security purposes and stored on a secured server. We may share demographic information with our partners and advertisers. This is generally not linked to any personal information that can identify any individual person. However, Lawless Harley-Davidson® may send E-mails or mail about special offers at the Dealership or other offers or information that may be of interest to the user based on the information we collect. 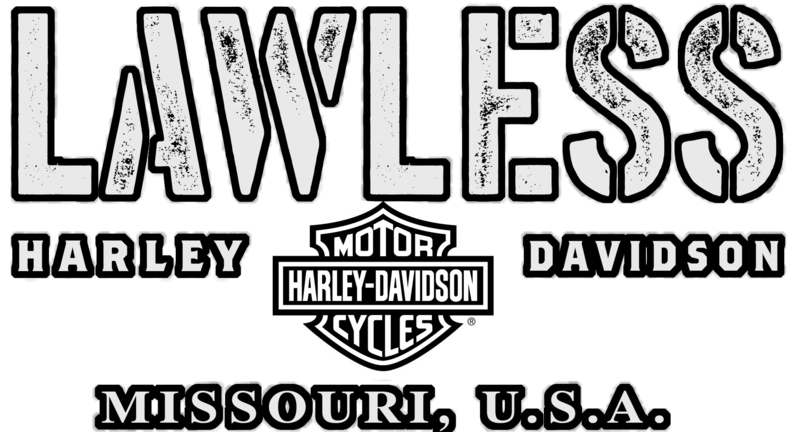 Lawless Harley-Davidson® uses an outside company (such as UPS, USPS, Fed Ex. etc.) to ship orders, and a credit card processing company to bill users for goods and services. These companies do not to our knowledge, retain, share, store or use personally identifiable information for any secondary purposes. This web site contains links to other sites. Please be aware that Lawless Harley-Davidson® is not responsible for the privacy practices of such other sites. We encourage our users to read the privacy statements of every web site that collects personally identifiable information. This privacy statement applies solely to information collected by this web site. Lawless Harley-Davidson® may send the user site and service announcement updates which contain important information about the service. We communicate with the user to provide requested services and in regard to issues relating to their account via e-mail or phone. If a user's personally identifiable information changes (such as address or E-mail), or if a user no longer desires to receive information from Lawless Harley-Davidson®, we will endeavor to correct, update or remove that user's personal data from our database.